These features can help you keep track of your class's games, of your students' progress, of the status of their games in the Gamestar community. Click here to learn more about premium educator packages. Student Tracking is a space where you can find the accounts of all students in your class. Here you can see each student’s published games and stats, draft games, reviews and comments. This report is especially useful when tracking students’ progress on specific assignments. 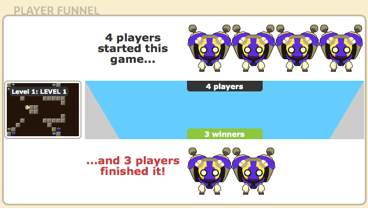 When you assign your class a design challenge, you can see which students have published a game to complete the challenge, you can play their games, and you can view their reviews and comments on each other’s games. 1. Go to your Workshop in Gamestar Mechanic. 2. Under Mechanic Profile click on the Student Tracking button. Number of missions played out of the total number of missions in the quests. My Class is a section in Game Alley where you can find all the games made by your class. As you ask students to design games, you will need to find their games, and they will need to find each other's games. Both teachers and students have access to My Class. The students’ games will also exist in other categories in Game Alley (such as Featured Games, New Games), but those other categories will exhibit games from all of the Gamestar community. The My Class category in Game Alley will only contain the games from your class. 1. Go to Game Alley. 2. Scroll down to the last section to find My Class: The most recent games by your students will be displayed first. The statistics of a game are its visual representation of how many players attempted a game and how many beat it. Students on a premium account can see the stats of their own games, and teachers on a premium account can see the stats of all of their students’ games. Stats are found next to the game’s thumbnail in Game Alley. Students and teachers can view the scaling of difficulty in their game’s level progression, and see whether their game moves from easy to hard, hard to easy, or does not change in difficulty level. The Stats feature allows learners to be analytical. They can view which levels of their games are not easily beatable, and hypothesize as to why. Students may find that a game they thought easy when they designed it, is actually really hard for other players to beat! The chart also shows how many players have started the game, and how many have finished it. 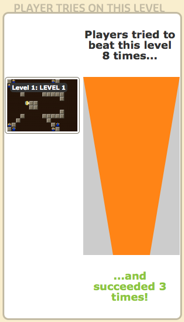 You can click the blue funnel to see player tries: how many times players tried to beat the level, and how many actually beat it. Stats can be helpful in evaluating the difficulty levels of a game. 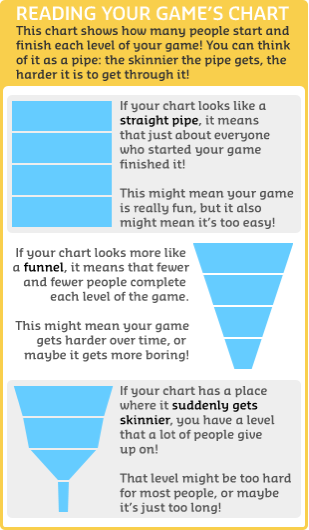 If you assign your students to make a game with a specific difficulty, you can use these stats to see how well your students' games fit the design requirements.